Confiscated elephant tusks: Thai customs officers seize four tons. Thai customs officers and confiscated elephant tusks in Bangkok on Monday. 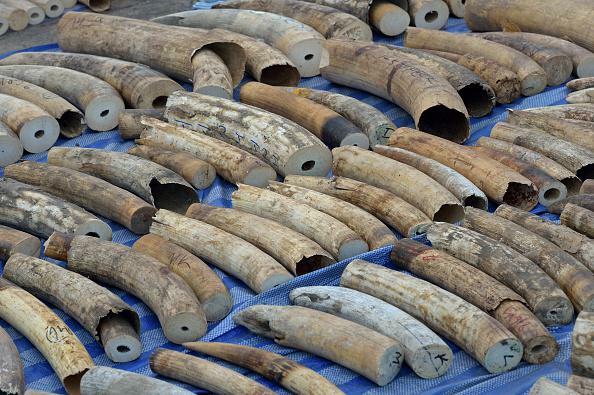 Customs authorities have seized 4 tons of elephant tusks smuggled from Congo in what they say is the Thailand’s largest-ever ivory bust, the AP reports. The shipment—labeled as “beans” and transported in bean sacks—was headed for Laos, from where it would have been distributed to “buyers in China, Vietnam and Thailand.” Some 739 tusks were seized; there are about 220 in the picture above, meaning that the photo shows about a ton of ivory on the ground. The total shipment was said to have a value of $6 million. The Atlantic investigated the origins of the demand for illegal ivory in 2012, writing that the substance has “little inherent value but prized social significance” as a raw material out of which luxury items are made.